Welcome to Yudanaka Onsen Seifuso. This Traditional Ryokan was built in 1890. You can find very eccentric sculptures throughout the ryokan. Guests can relax in different styles of hot spring baths. 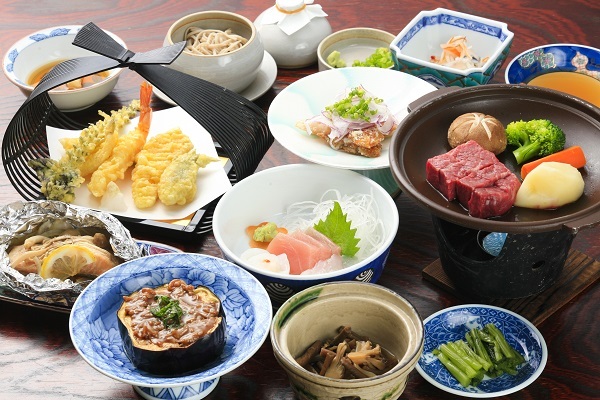 Yudananaka Onsen Seifuso serves fresh, seasonal Japanese cuisine to their guests. 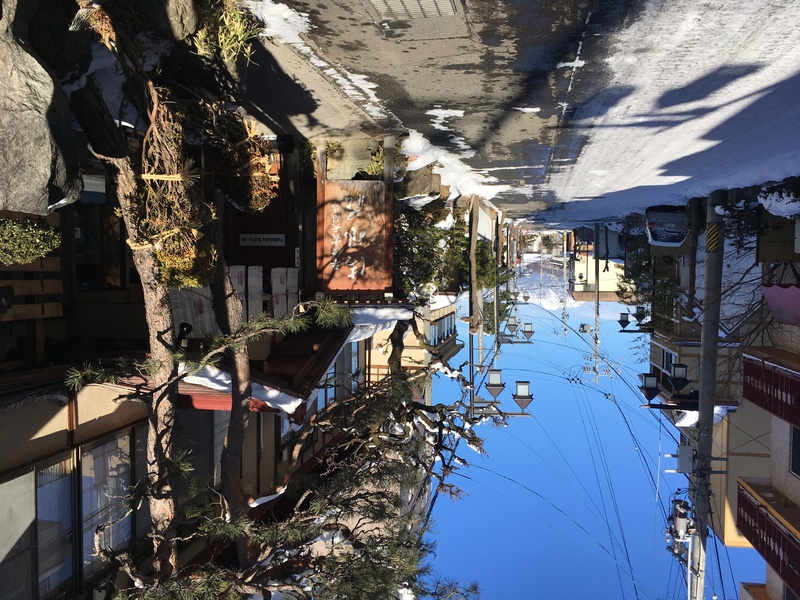 In the winter please check in to Yudanaka Onsen Seifuso early as there is a lot of snow on the road leading up to the ryokan. It is better you check-in early at the Ryokan especially in the winter because the way to the Ryokan is full of snow. Please note: The Snow Monkey park is open from 9:00am to 16:00. A lovely experience with accomodating hosts! Yudanaka Onsen Seifuso was a lovely ryokan - very comfortable, great food, very close to train station, and a lovely hot bath. The staff offered to drive me to the snow monkey park which was so nice of them. Highly recommend. A great Ryokan experience at a great price. The Ryokan is a little older compared to some others but does hold that traditional charm. Rooms are large and spacious, heated well, and comfortable. The onsens baths are absolutely stunning. With 3 baths in total; one male, one female and a private bath. The male and female baths rotate in gender availability throughout the day. One of the baths is outside (though fully closed off from outside eyes) which was a lovely experience in the snow. Food was absolutely delicious and plentifu - A proper Japanese degustation. Atmosphere at the the Ryokan is extremely quiet and tranquil. You'll likely not speak to another soul outside of dinner and breakfast. It was lovely. Location is only a 5min stroll from train station. Overall a great experience and we would be back. Price is also on point. Thanks Yudanaka onsen seifuso! We enjoyed our stay at Yudanaka. It's well located but a little difficult to find with google maps but as usual local people were glad to help. It's an old establishment but quite comfortable. the room was very big and had natural light and a private WC which was very convenient. We didn't have enough time to check all the onsens; the private one was great, real natural hot water. The food was very good. We ate in a private room - we'd have preferred to meet some other guests. The owner and all the other staff were very helpful. Finding a ryokan to stay in solo that also had vegan meal options was difficult, but Yudanaka Onsen Seifuso was extremely accommodating. The room itself was very large, clean, and had great natural lighting. I tried a couple of their onsen (I think they have had three in total): one that was outdoor, and one that was indoor. Both were great, but the outdoor one (which is still enclosed by the building), was probably my favorite. Very clean, relaxing, and definitely hot. Just a few minutes and my body was jelly. My night's sleep was probably the best I had on the trip - I was over my jet lag by the next morning. The food was delicious. They were able to make a full vegan course for dinner and breakfast that hit all the flavors and didn't have me feeling like I was missing out. I left each meal stuffed and satisfied. The staff was friendly and receptive to any questions or concerns I had. They were kind enough to drive me up to the Monkey Park - which is nice, since you get a nice view of the town on the way. The town itself was small and quiet, though quite pretty. My stay was mid-April, so not much snow, but the sakura had just begun to bloom, and many of the streets were lined with their trees. The Monkey Park was fine, but very touristy and a bit out of the way (around a one kilometer walk from the nearest bus stop). Overall, I highly recommend Yudanaka Onsen Seifuso. The area is nice (and the onsen itself is a 2 minute walk from the train station), the staff is friendly, the food is tasty, and I left relaxed and ready for the rest of trip. great hospitality and absolutely fair polite & kind people; we checked in late and the owner and his son were waiting for us and provided us with light dinner and we had access 24/7 to onsens, which was great. It's located literary 5 min from train station, food was great and the room was large and bed was traditional clean and absolutely comfortable, WIFI was very good and the owner dropped us off to see the snow monkey park, he wasn't very happy in general but accommodating overall. Very comfortable and cosy Ryokan. The room was warm and comfortable. The food was fantastic, and the onsen was fantastic. My wife and I took the opportunity to use the private onsen which was very hot but was fantastic for aching muscles. The location of the Ryokan is also excellent if you are wanting to visit the Snow Monkeys which are a short drive away. Would love to stay here on our next trip to Japan. My two nights at Yudanaka Onsen Seifuso were exactly what I was hoped, being a nice relaxing time away from the city. The owners and staff were very friendly and helpful, and it was magical sitting in the rotemburo at night with the snow falling. A friend and I had a lovely two day stay at the ryokan in October 2017. This was our second visit to Japan and our third ryokan. It was a contrast to our previous choices (more famous ryokans in more famous locations) but this was a perfect visit. We wanted a few days relaxing properly and to spend time sleeping, eating and spending time in the onsen and this was a great opportunity to do just that. The town has little to recommend it which was good as we had nothing to distract us from the ryokan itself. The staff spoke little English and we speak to Japanese but that didn't matter at all. They were incredibly nice and helpful. I have a couple of odd dietary requirements and I thought I might struggle to eat as well as my omnivorous friend, but not at all. The food was amazing and the staff were really careful to make sure I ate properly. The insensitive were lovely. We spent time in the women's indoor onsen, complete with floating apples, and the outdoor onsen during the women only timings. Both are smallish but lovely. Our room was very nice...and we were upgraded without us asking. Thanks to the onsen staff for looking after us and to Japanese Guest Houses for finding us somewhere at short notice that met all of our requirements. We plan to return. Beautiful little ryokan in a small town. The family who owns it is wonderful and all other reviews on this site are accurate in their descriptions. Would definitely visit again. Charming and intimate place, very kind staff! We enjoyed our stay very much! Great value, nice hot spring, delicious food, charming atmosphere. We stayed 1 night in this ryokan with our young kids and 2 other families. Very clean and confortable rooms. We enjoyed dinner in a private dinning room with our friends. Baths were great (loved the apples floating in the water). The hotel staff was friendly and drove us to the monkey park. The town of Yudanaka itself doesn't have much to offer. we highly recommend this ryokan. Walking distance from the station. We (3 friends) stayed 1 night in this ryokan. It was a very comfortable room, and the food was delicious. What really made the stay memorable, however, was the incredible outdoor onsen, and the kindness of the owners. Not only did they drive us up to the monkey park, but they also gave us the bus details so we could get back (east trip) and lots of information about Obuse (our next stop). It's easy walking distance from the station. We stayed one night in this Ryokan and had a really great time. Nothing was too much trouble for our hosts: our room was beautifully made up and very comfortable; we were treated to a fantastic dinner and breakfast; given a ride up to the snow monkey park; and fresh apples for our trip to Kyoto! The outside onsen was a real treat. You won't regret deciding to stay here. We stayed at this Ryokan as a base to visit the snow monkeys. The staff were wonderful and supplied our friend with gluten free meals. They even offered to drive us to the Snow Monkey Park! The location is great, it's just a few blocks from the Yudanaka train station and there are bars and restaurants close by on the top of the hill, as well as down the bottom. The rooms were warm (there was snow outside) and clean. Very traditional setting. There are three onsen/baths on site: An indoor private bath that can be locked, an indoor bath for everyone to use, and an outdoor bath for every to use. Each bath has different times that each gender can use them, and each bath is open 24hrs. I recommend that EVERYONE try the outdoor bath, regardless of the weather, it's just beautiful (and warm!). Lovely atmosphere; dinner was elaborate and yummy (and catered decently for my partner's and my needs). The private onsen were really lovely, and the next morning, the owner's elderly father gave us a lot of fruit, as the owner himself drove us and some other guests to the entrance to Jigokudani. We've stayed here for 1 night. The owner drove us to the monkeypark on day one. After the monkeypark we used a private onsen which was great! The dinner was typically Japanese, very delicious. Also the breakfast was Japanse and fine. The owner and his parents are really friendly and they try to give you a cosy feeling. This place was simply magical. The family that runs it made us feel like we were long lost family. We arrived in a snow storm 2 hours late from train delays and they were out looking for us to make sure we found the place. We arrived to an amazing meal. They took care of my pregnant wife like family. The whole place is just awesome. If i make it back to Japan it will be at the top of my list. Also - the Monkey was very easy from this place, they drove us there and gave us a lot of information. The park entrance is basically on the other side of town. My husband and I stayed here just one night in September. It was perfect. There was such great customer service! I was a little skeptical at first since you can only book through this website, but rest assured, there's nothing to worry about! The Ryokan is only about a 3-5 minute walk from the Yudanaka train station, easy access even if you have a lot of luggage (like we did). :) When we arrived, the owner drove us to the base of the snow monkey park so we could quickly get up and enjoy being around the monkeys. I even forgot something mid-way to the park and he turned around so I could have it. They were beyond accommodating! We had a bit of trouble figuring out the bus on our way back, but that's a separate issue. ;) When we got back, we toured our enormous room, which was nicely prepared with treats, tea, & our traditional bed/futon. Then we were treated with a traditional Japanese dinner in a private room. Everything was so delicious! The momma chef even visited us and let us know how to eat everything. :) After dinner, there are a couple different onsens you can use and some private ones as well. This was half the reason we booked this Ryokan, because my husband and I could use a private onsen. The water was so hot and made our skin feel SO good! There's even a ping pong table downstairs, so we played a bit. In the morning, we had another delicious meal with a traditional Japanese breakfast. I wish we could find meals like this in Seattle, the food was seriously good. The momma and poppa of the Ryokan gave us some apples when we left and were really excited when we told them we were headed to Kyoto. :) They were so cute and so accommodating! I would definitely stay here again and definitely recommend you to stay here as well! And the cost was really affordable, especially after staying in Tokyo for a week. Don't hesitate, go and enjoy a lovely getaway at this beautiful Ryokan! A friend recommended Seifuso on my recent trip to Japan - it was a highlight. We spent 2 nights in the middle of our holiday, the perfect place to rest, relax & recharge. It started snowing about 30 minutes out of Tokyo & continued to until we were leaving. This Onsen is a short walk from the train station - we were warmly welcomed by our hosts who were so generous, kind & helpful. The room was large & comfortable - the toilet seemed to be recently upgraded & was awesome! The food was AMAZING, although despite ordering vegetarian meals for my daughters the message did not seem to get through until the last meal. Perhaps Japanese Guesthouses could give you something to print in Japanese to give to the hosts on arrival. The hot springs were lovely & a great place to warm up after visiting the Snow Monkeys. Our host drove us to the Monkey Park & provided boots for us. It was amazing, we loved it & would (& have) recommend it to anyone traveling to Japan. Our hosts gave us gifts as we left - you don't often experience anything quite like this. We definitely hope to go back one day. I travelled with my teenage daughters for a mid holiday break to stay at Seifuso - it was one of the best decisions. It is the perfect place for some rest & recharging. Easy to find, close to the train station, warm & cosy, kind & generous hosts. The room was beautiful, spacious & warm. It snowed the whole weekend but we never felt cold. The home cooked food was AMAZING despite ordering vegetarian meals for my daughters, it seemed the message did not get conveyed - perhaps Japanese Guesthouses could provide something in Japanese to provide to the hosts. The hot baths were the perfect way to warm up after being out in the snow. The hosts provided boots for us & drove us to the Snow Monkey Park - you walk 1.6km to the monkeys, who just go about their business not bothered by the humans gathering around to take photos. Such good value at Â¥500 entry... A special mention must also be made for the recently upgraded toilets at Seifuso - never seen a toilet like it, but I want one! Our trip to Yudanaka was a highlight of our trip & would most definitely recommend it to anyone traveling to Japan. Within walking distance from the train station, this Ryokan was amazing. Family run staff could not have been nicer, even driving us to the monkey park. Rooms were nice and we were served privately in an intimate setting. Which brings me to the food: This was towards the beginning of our trip and we didn't have better food the entire time in Japan. Plenty of food and it was all incredible. It was December so I believe a few of the baths were not available but we had a private, indoor bath which was lovely. Four of us booked 2 rooms for 3 nights at Seifuso. The ryokan was old but it was well kept and clean. It snowed during our stay but the rooms were well heated and we loved the warmers under the table in our rooms where we would tuck our legs under the table comfortably. The futon was amazingly comfortable. Initially, we were apprehensive when we were informed during the booking that there was no toilet in the room and we have to use the shared toilets. However, we were amused that the lack of toilet in the room was actually very bearable and it was not a problem at all. We only had dinner at the onsen for one night. The full Japanese course was delicious and there were many variety provided and serving was more than we could finish. (Btw, there is a very good nabe restaurant close by the ryokan too.) What struck us was the wonderful hospitality provided by the family and the workers. Although there was a language barrier but they tried their utmost to communicate with us. They drove us to the Monkey Park and gave us explicit directions to get back to the ryokan. What we love were the snow boots that they asked us to wear. We were glad that they were so thoughtful cos it would not be easy to walk around without them. They were so comfortable that we borrowed from them every day! The family also helped to clear the snow and ice on the windscreen of our car in the monring... It is such little gestures that we really appreciated. At the end of our stay, the dad gave us some crunchy apples and bottles of homemade apple jam. I would say it is the family's hospitality that adds to the charm of the quaint ryokan. A one of a kind experience, great hospitality and a wonderful establishment. The heating in the room struggled with the freezing temperatures but it was made up by the wonderful outdoor onsen. A truly unique experience in a great location. Great Place. It was more than what I had hoped for in the 2 nights that I had stayed. As Yudanaka doesn't offer very much in terms of food choices, I would highly recommended taking your meals (breakfast and dinner) at the ryokan. Absolutely delicious Japanese food. My sister and I stayed 2 nights and we have to say it was certainly one of the major hightlights of our trip in Japan. We were surprised at how close the ryokan was to the station and were extremely thankful for the distance because of our massive bags. We arrived late but they were still as accommodating and friendly to us despite our tardiness. The owners really go above and beyond to ensure that we were comfortable and well-looked after even going as far as to lend us snow boots and a life to the monkey park (as previous visitors had already mentioned). In our room the futons were already prepared and we found that we had a view of the street just above the entrance. We loved our room from the little indoor seating area to the lovely decore. Sleep was easy to come by and the onsens which were open 24 hours a day were convenient and extremely relaxing after walking around all day. The breakfast and dinners were amazing and somehow between our meals we'd find that the futons were laid out and packed away perfectly each time we returned. When we were leaving they even returned the rings I thought I had previously left in the onsens, gave us an apple each as a gift and the son even gave us a discount coupon for the robot show we wanted to watch when we said we were headed to Tokyo next. I highly recommend this ryokan if not for the wonderful service then for the relaxing hotspring experience. It was my first visit to Yudanaka for Jigokudani Snow Monkey Park. The ryokan stay at Seifuso was a wonderful experience, giving me a glimpse of traditional way of life in old Japan. A night stay came with sumptuous spread of Japanese dinner and breakfast which the host took pride in serving the guests. The host took the extra mile to drive the guests to the entrance of Snow Monkey Park. That itself has saved us a great deal considering the snowy weather condition. The room, though old, was clean and warm. Shared toilet is just right in front of the room for quick access. 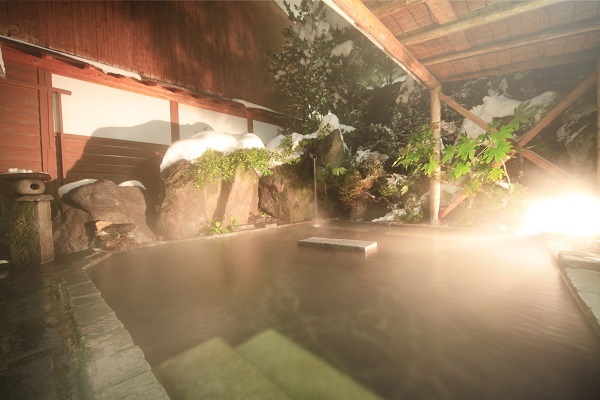 And not forgetting the outdoor onsen experience in winter, which was also my first, was awesome! I truly enjoyed the stay and the food. Will not hesitate to recommend it to friends. everything was fantastic. amazing hospitality, incredible food for both dinner and breakfast, and so beautiful and cozy at the same time. they drive you to the monkey park and let you borrow snow boots. They even let my husband and I have the beautiful outdoor onsen all to ourselves after hiking in the snow- no extra charge! LOVED our stay here and would do it again!